Samsung has detailed which handsets will receive the Android 7 Nougat operating system update. 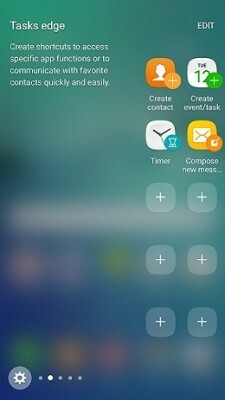 Some of the core changes to the platform include a refreshed Quick Settings panel, OS-level support for split screen multitasking, four new performance modes, and Samsung Pass, which allows people to secure various aspects of their Samsung account with a fingerprint. The company this week began distributing the new operating system to the Galaxy S7 and S7 Edge. It also plans to update the Galaxy S6, S6 Edge, S6 Edge Plus, Note 5, Tab A with S Pen, Tab S2 (LTE), Galaxy A3, and Galaxy A8 to Android 7. As for timing, Samsung said this collection of devices should see Nougat at some point during the first half of the year. T-Mobile and Verizon Wireless are sending out the July 1 Android security patch to their variants of the Samsung Galaxy Note 5 and Galaxy S6 edge+ smartphones. Google made the security patch available last week. It plugs a number of holes in the code, including some that could lead to remote code execution. These security updates can be downloaded and installed over the air. Verizon Wireless has made system updates available for the Samsung Galaxy Note 5 and S6 Edge+. The update for the Note 5 resolves several issues that were introduced when the device was updated to Android 6.0 Marshmallow. Specifically, it smoothes out trouble connecting to the internet, frequent data disconnection, and problems while loading files or web pages. The update for the S6 Edge+ installs Android 6.0 Marshmallow and the latest Edge Panel features from Samsung. It also adds WiFi calling and improves the behavior of Live Broadcast. Verizon suggests owners of the Galaxy Note 5 and Galaxy S6 Edge+ download the updates over a WiFi connection. The updates are free. Verizon Wireless today confirmed that it is enabling Samsung Pay on the Samsung Galaxy S6, S6 Edge, Note 5, and S6 Edge+ through a software update. "After the update, customers will be able to download and install the [Samsung Pay] app from the Google Play Store," said Verizon in an email to Phone Scoop. "The update will be pushed out to customers in phases this week." Verizon said S6 and S6 Edge owners can manually download the update via the system settings. Verizon's competitors have already enabled Samsung Pay on their Samsung handsets. The service supports both NFC and MST for mobile payments and is available at a wide range of retail locations. Samsung Pay competes directly with Android Pay on Android smartphones. Android Pay is limited to NFC-equipped retail terminals. Samsung today made its mobile payment service, Samsung Pay, available to U.S. consumers. The service is compatible with only a few phones, including the Galaxy Note 5 and the Galaxy S6 Edge+, S6 Edge, and S6. AT&T, Sprint, T-Mobile, and U.S. Cellular support Samsung pay, but Verizon Wireless does not. Consumers can add their American Express, Bank of America, Citibank, or USBank MasterCard or Visa credit/debit card to the service, but it lacks support for Chase at launch. Samsung Pay differs from Apple Pay and Android Pay in one significant respect: it supports both NFC and MST transactions. MST, in particular, is more widely available than NFC and works with most regular credit card terminals used by retailers around the country. 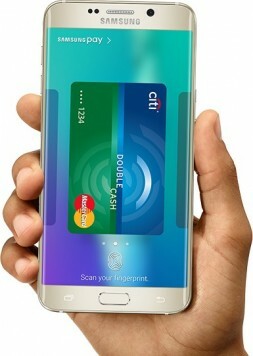 Samsung Pay is secured via fingerprint, and credit card information is tokenized so it is protected during transactions. Samsung will reward Note 5 and S6 Edge+ owners who activate Samsung Pay with a free wireless charger or a free wallet flip cover (through Oct. 11). Samsung Pay is free to set up and use. Samsung said it will make several monthly device payments for people who buy a new Galaxy Note 5, S6 Edge+, S6 Edge, or S6. Under the terms of the promotion, Samsung will reward customers with up to $120 in payments towards their new phone as long as they register with Samsung and buy the device through an installment plan with their carrier. Customers must purchase the Galaxy smartphone between Sept. 25 and Oct. 9, and claim the promotion by Oct. 16. Samsung will then cover device payments through the end of the year. Further, Samsung is offer a $100 Google Play gift card to anyone who turns in a working iPhone (4s and up) when they purchase the new Galaxy handset. The offer is valid with most U.S. wireless network operators, with the exception of AT&T. Samsung has unfurled the "ultimate test drive" in order to tempt iPhone owners to switch to a new Samsung handset. The company is letting iPhone users test drive a Galaxy Note 5, Galaxy S6 Edge+, or Galaxy S6 Edge for 30 days for just $1. Samsung will send a handset and an active SIM card to those who register for the promotion from an iPhone. The rental must be returned at the end of a month and borrowers will be on the hook for any damage incurred during the trial (cracked screens, etc.). People who don't return the handset will be charged the full retail amount. The test drive promotion is only available to U.S. residents. The majority of U.S. wireless network operators will offer the Samsung Galaxy Note 5 and S6 Edge+. AT&T, Sprint, T-Mobile, U.S. Cellular, and Verizon Wireless all plan to sell the new handsets from Samsung. 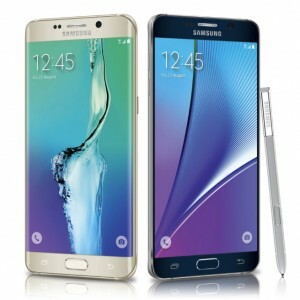 The Note 5 and S6 Edge+ will also be sold by Amazon.com, Best Buy, Costco, Sam's Club, Target, and some Walmart stores. Carriers and retailers will confirm specific pricing and availability details. Samsung today announced the Galaxy Note 5 and the Galaxy S6 Edge+. Both handsets adopt the design language seen on the Galaxy S6/S6 Edge, which were announced earlier this year. They feature metallic frames and dual-Gorilla Glass 4 surfaces. The Note 5 carries forward the stylus with dedicated productivity apps, while the S6 Edge+ is essentially a larger version of the S6 Edge. 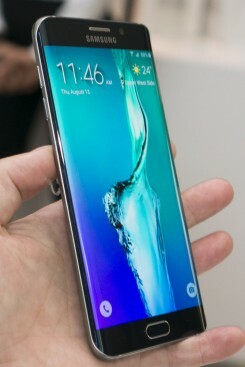 The S6 Edge+ does not have a stylus, but features dual curved screens with content that is visible on the side panels. The Note 5 an S6 Edge+ specs mirror those of the smaller handsets closely. The Note 5 and S6 Edge+ measure 7.6mm and 6.9mm thick, respectively. The Super AMOLED display measures 5.7 inches across the diagonal and includes 2560 by 1440 pixels (quad HD). The 16-megapixel main camera boasts optical image stabilization, auto HDR, and a Quick Launch feature that starts the camera app in less than a second. The user-facing camera rates 5-megpaixels; both have an aperture of f/1.9 for better low-light performance. The two handsets rely on Samsung's 64-bit Exynos 7420 octa-core processor. It pairs two banks of quad-core processors, one clocked at 2.1GHz and the other clocked at 1.5GHz. The processor is paired with 4GB of LPDDR4 memory and UFS 2.0 flash for faster storage performance. The phone includes a 3,000mAh battery that supports both the WPC and PMA wireless charging standards, in addition to quick charging. Other specs include Category 6 LTE, dual-band WiFi, Bluetooth 4.1, ultra power-savings mode and Android 5.1 Lollipop. The Galaxy Note 5 and Galaxy S6 Edge+ will be available in 32GB and 64GB internal storage options. The Note 5 comes in either black or white, and the S6 Edge+ comes in either black or gold. Preorders for the phones start today and they ship August 21.